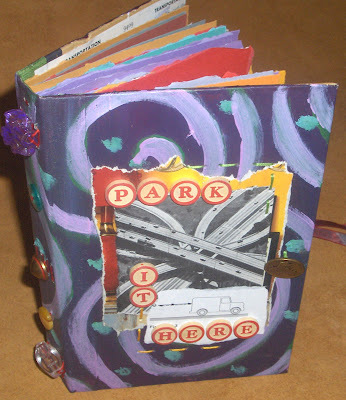 Kjersten Anna Hayes submitted this book for our book swap. 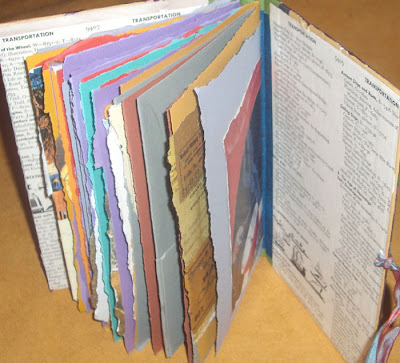 This is made from an old textbook cover which has been recycled and given new life; it has been painted, collaged, and bound into a a unique album with a transportation theme. The pages inside are a mix of coloured papers and pages from various sources and all the collage items, colourful buttons on the spine, and endpapers match the theme. park it here, i love that. What fantastic pages! great book Kjersten! What a great journal! I love mixed paper journals. Is that wishful thinking Maiko or did it really make its way to your house? haha nope, it really is mine! :D thanks kjersten! I love it! It's so festive! Glad you like it, Maiko!